Honolulu, HI – Bishop Museum honors the legacy of Duke Paoa Kahanamoku in a special exhibit from Aug. 9 – Nov. 30, 2015 in the J. M. Long Gallery. This exhibit will illuminate the many facets of Duke as an Olympian, surfer, ocean hero, movie star, ambassador of aloha, and family man. Duke, a public figure unrivaled in grace and humility, was a four-time Olympic participant and one of the greatest swimmers and surfers of all time; but his legacy transcends his winning resume. The beauty of Duke’s legendary fame are his core values of aloha, strength of character, and good sportsmanship which have lived, and will continue to live, through generations. This original Bishop Museum exhibit brings to life the truly Hawaiian story of Honolulu-born Duke Paoa Kahanamoku, in celebration of the 125th anniversary of his birth. His simple beginnings, island heritage, international fame, and lasting legacy will all be explored with a unique collection of archival video and photographs, objects from his life, and fun activities that allow visitors to surf and play with one of Hawai‘i’s greatest native sons. Visitors can take control of a replica of Duke’s surfboard to reenact his legendary 1917 ride in a 3D video game environment, allowing them to experience how Duke rode a towering wave for more than a mile at Waikīkī on a finless board. The exhibit will also have a “Race Duke” swimming interactive where visitors will try to replicate Duke’s 1920 Olympic record time in the men’s 100 meter freestyle by using a table top upper body pedal exerciser. The Olympian – Famed for his swimming prowess and natural ability to cut through the water like a fish, Duke was a record-breaking Olympian and medalist in many other competitions who represented Hawai‘i in the sports world for over 20 years. His gold and silver Olympic medals, plus dozens of other medals and trophies, will be on display. The Surfrider – Duke grew up on the shores of Waikīkī and was an early exponent of surfing when its revival began there in the early 1900s. He is credited with having introduced and popularized the sport in Australia and beyond, and executed the longest ride ever recorded in Waikīkī. Visitors will appreciate viewing his famous 10-foot redwood “Duke” surfboard framed by the boards of legendary surfers Tom Blake and John Kelly. The Movie Star – Duke appeared in nearly 30 movies during the 1920s in Hollywood, and a few more in later years. He worked with and befriended legends like film director John Ford, and starred opposite John Wayne, the other ‘Duke.’ The exhibit will spotlight photos of Duke on the set in character from various films and with celebrity friends such as Arthur Godfrey (well-known American radio and TV broadcaster and entertainer), Charlie Chaplin, Cary Grant, and more. The Business Man – In addition to his sports triumphs, Duke was successful in the business world. His ventures were diverse and ranged from owning two gas stations to being an aloha shirt promoter. 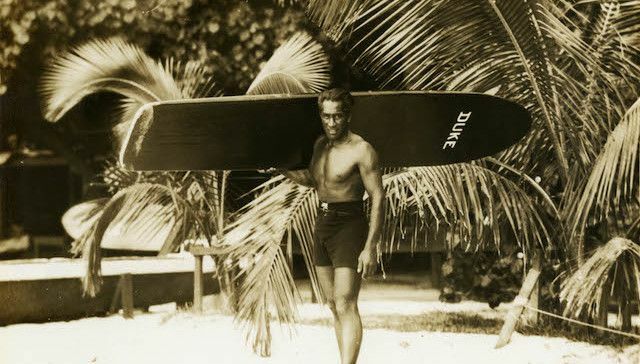 Later in life, he became the front man of a small commercial empire that included Duke Kahanamoku’s Restaurant, the Duke Kahanamoku Invitational Surfing Championships, and an array of Duke Kahanamoku signature merchandise including floral-print tennis shoes, aloha shirts, surfboards, bellyboards, skateboards, ‘ukulele, and drinking glasses. Throughout his business endeavors he also served as the sheriff of Honolulu for 26 years. Duke’s sheriff’s badge and other artifacts from some of his many ventures will be on display. The Ambassador – Because of his international fame and gracious character, Duke served as Hawai‘i’s unofficial greeter for famous visitors for decades, sharing its unique native culture and values with the world. Among his keepsakes, visitors can see Duke’s personal ʻukulele, which always traveled with him as an ambassador to the world. Additionally, photographs of Duke greeting notable visitors like actresses Mary Pickford and Shirley Temple will also be highlighted. The Family Man – Born in 1890, the oldest of nine children, Duke was part of a large extended ‘ohana, and he learned the ways of the ocean from childhood at his family’s home at Kālia, located next to today’s Hilton Hawaiian Village Waikiki Beach Resort. A variety of artifacts will provide an unprecedented look into this aspect of Duke’s life including photos of his childhood and the wedding rings that he and his wife, Nadine, once wore. Visitors can see a charm bracelet that Nadine made out of Duke’s medals, among other one of a kind items. Previous Post Summer 2015 won’t be the same..